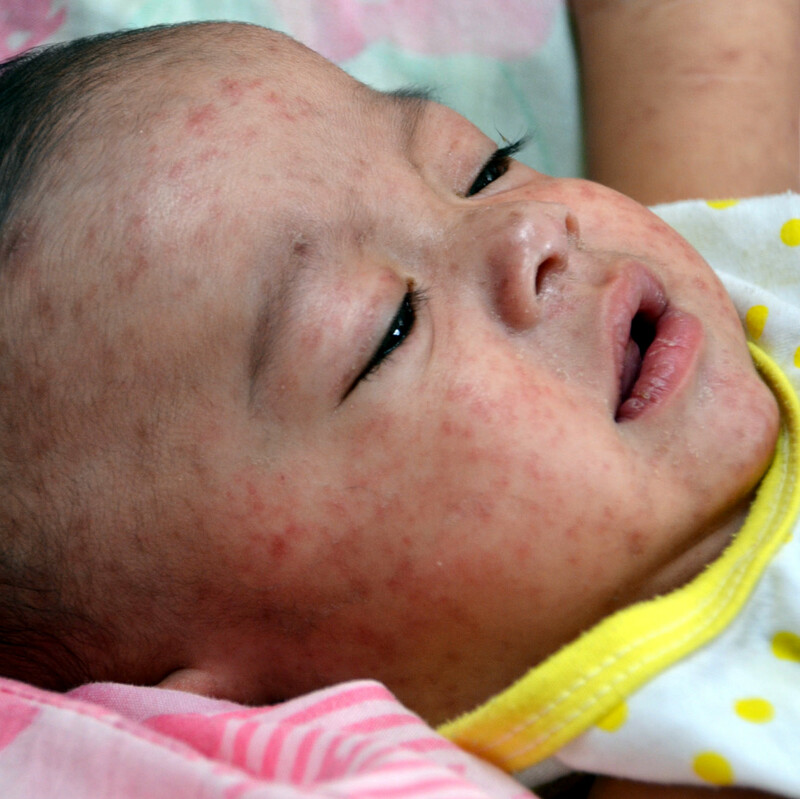 Measles is one of the most infectious diseases in humans. It is also known by the names English measles, morbilli and rubeola. Measles is now the third most common vaccine-preventable cause of death among children throughout the world. Before a measles vaccine was developed, most people had caught measles in childhood. Universal vaccination was introduced in 1969 into New Zealand, although uptake of the vaccine had been low until recent years. The last two major measles epidemics in New Zealand occurred in the 1990s with thousands of cases, hundreds of hospitalisations and seven deaths. Smaller outbreaks continue to occur, started when someone brings the disease back from an overseas trip. As measles is extremely contagious it spreads very quickly, usually between un- or under-immunised people. Immunisation rates in New Zealand in children by the age of two years are high and therefore outbreaks typically affect unvaccinated older children, teenagers and adults. Measles virus is highly contagious. It is spread through the air by infected droplets or by direct contact with secretions from the nose or throat of infected persons, for example by touching contaminated items or surfaces. It can survive for up to 2 hours in the air. 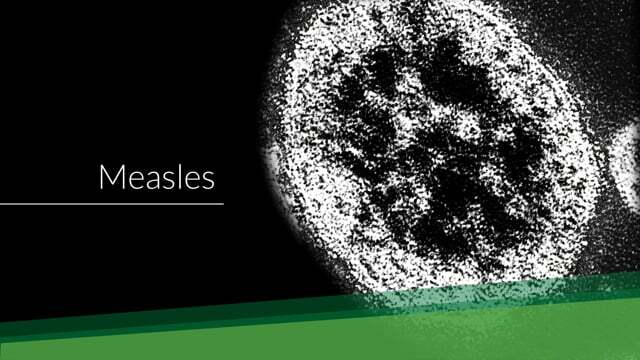 A person with measles is most contagious from when symptoms start until three to four days after the rash appears. There is no specific antiviral treatment for measles. Supportive care including good nutrition, vitamin A supplements and adequate fluid intake, including hospital care when needed, can help to manage severe complications. Complications from measles are common. The measles virus suppresses the immune system, lowering the body’s ability to fight other infections, for several years after infection. The risk of complications and death is greater in children under five years and adults over 20 years of age. Common complications include ear infections, diarrhoea, and pneumonia. In New Zealand, more than 15 measles cases out of 100 are hospitalised. Pneumonia accounts for nearly two thirds of measles deaths. Approximately 1 in 1000 cases develop encephalitis (inflammation of the brain), of these 15% die and approximately one third are left with permanent brain damage. Several years after infection, 1 in 100,000 measles cases will develop subacute sclerosing panencephalitis (SSPE), a degenerative brain disease; this condition is always fatal. Other complications include immune thrombocytopenic purpura (ITP), a problem of blood clotting, and inflammation of the small airways in the lungs, the heart, kidneys or liver. Measles during pregnancy increases the risk of miscarriage and premature labour. The risk of very serious disease is greatest for anyone with a weakened immune system. Such people are often unable to be immunised and rely on protection from those around them being immunised. Death occurs in approximately 1 in 1,000 reported cases of measles, overall, in developed countries. Rates for death and disability are much higher than this in countries with poor nutrition and reduced access to good healthcare services. MMR vaccine, given on-time, is the best way to prevent measles. It is available free in New Zealand to people born on/after 1 January 1969. Two doses of the MMR vaccine is 99% effective in preventing measles. No measles-only vaccine is available in New Zealand. MMR vaccine, if given within 72 hours of exposure to measles virus, may provide protection to the unimmunised and thus limit the spread of measles. In the event of a measles outbreak, unimmunised children and adults born after 1 January 1969, who do not have evidence of immunity against measles and have contact with infected cases are advised NOT to attend school, early childhood services or public places for 14 days after their last contact with the infected person or until advised by the local population health officers (or Medical Officer of Health). It is recommended that anyone born after 1968 have documented evidence of two doses of MMR vaccine given after 12 months of age. This is in addition to any measles-only vaccine they may have received. Regular epidemics still occur in many countries. It is important for all travellers to be immunised to prevent the risk of causing an outbreak in New Zealand upon return/arrival from overseas. As with any medicine, very rare severe allergic responses (anaphylaxis) can occur following immunisation. For this reason we ask people to wait 20 minutes after receiving vaccines. Foufou Susana recounts her mother’s story of losing six children in measles and other epidemics in Niue.